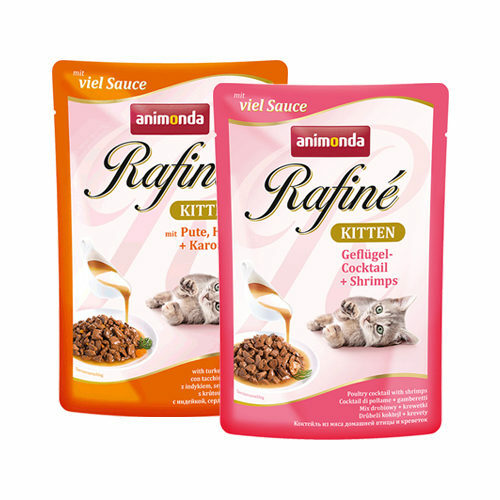 Animonda Rafiné Kitten is portion packed wet food, specially adapted to meet the nutritional needs of kittens. Tasty chunks of meat in sauce, one serving (100g) per pack, to guarantee flavour and freshness. Available in two flavours, poultry (chicken, turkey and duck) with shrimp or turkey, heart and carrot. Turkey, Heart and Carrot: meat and animal derivatives (heart 10%, turkey 10%), vegetables (carrot 4%), grains, oils and fats, minerals. Have you used Animonda Rafiné Kitten before? Let us know what you think about this product.